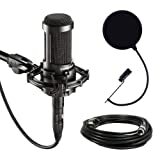 Pop shields, or pop filters are designed to take away those annoying “plosive” hard-hitting syllables that can ruin an otherwise perfect recording. When we sing, air leaves our body at different rates depending on the noise we are making. Certain letter sounds such as “T” and “P” will hit the mic harder with a fast rush of air and hit volume peaks that create a distorted sound (clipping) that can be a nightmare for getting rid of when you or your studio engineer are mixing your vocal track. To prevent this from happening most vocalists will make use of a pop shield that uses metal, nylon or foam to absorb these bursts of air. A lot of the time it boils down to the singer or sound engineer’s personal preference but there are some clear advantages and disadvantages of each type of pop filter. For many a cheap homemade device will make-do but more particular performers insist on more expensive options. The most common type of pop shield and the one people are most familiar with is a nylon one. A thin piece of fabric stretched between a plastic outer hoop is a very simply yet effective design. These are usually the cheapest pop filters you can buy so they are easy on the wallet. 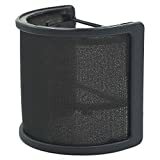 A slight disadvantage nylon pop filters have compared to metal ones is their tendency to break or rip if not cared for correctly. This ultimately depends on how well you look after your gear. 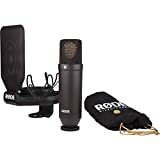 If your music gear gets thrown around a lot for travel and gigs you may prefer to spend a little bit more on a metal one. They are also trickier to clean and will unfortunately over time collect saliva and need replacing. We recommend the very fairly priced Neewer Pop Shield which is available in packs of 1, 2 & 4. A slightly more expensive option is to buy a metal pop shield. This is a great alternative to buying a nylon one as they are easy to wipe clean and will not collect unwanted moisture. They are also much more difficult to break or snap although you’ll still want to avoid bending it out of shape – not that it would make much difference to your sound. Some vocalists aren’t too keen on the fiddliness of pop shields and the awkwardness of attaching them to a microphone stand so instead they prefer a simple foam cover that attaches directly to the microphone. 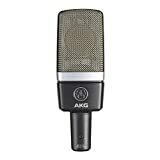 Lots of people feel that nylon and metal pop screens will add a slight phase sound to your vocals albeit very minimal and foam covers deal with this issue. The downside being that foam heads will cut out some of the higher sound frequencies in your vocal track – it all depends on what noise you are trying to make. 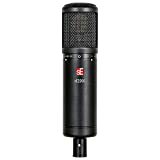 It also means that positioning your singer the correct distance away from the microphone becomes more complicated and will require more attention to adjusting the volume of the mic itself. 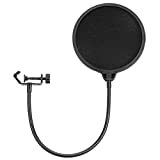 If you’re on a budget or you’re just a creative person who likes to make things then you can throw something together to make your own pop filter. You can turn it into a little project like in the video above or you can improvise with a spare pair of nylon stockings or socks that you might have lying around. Try experimenting with different materials and thicknesses until you find something that gives you the effect you desire. 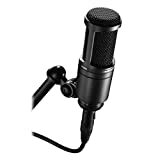 If you don’t feel like using any kind of pop shield or screen then you can position the microphone top down at around about eye level and angle it towards the vocalist’s mouth. 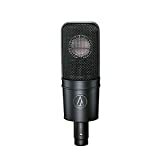 There are plenty of artists who prefer this technique but it requires a good singer who really has control of their voice – they will also want to avoid Ts, Bs and Ps directly into the microphone.